I wanted to keep secret about this sushi restaurant but I have to write about it because it’s a good thing in Vancouver. It just opened in April this year on Victoria Drive x 41st Ave. 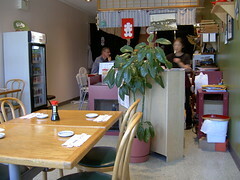 The name of the restaurant comes from the owner’s sirname, Mr. Fukushima. He used to be a veteran sushi chef of high end Japanese restaurants, Chiyoda and Yoshi. 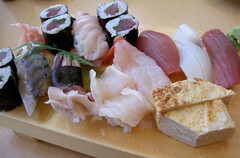 Further to his quality sushi skill, seasonable fish are imported from Japan by air. You can eat these really good quality sushi with a really reasonable price at Shimaya. 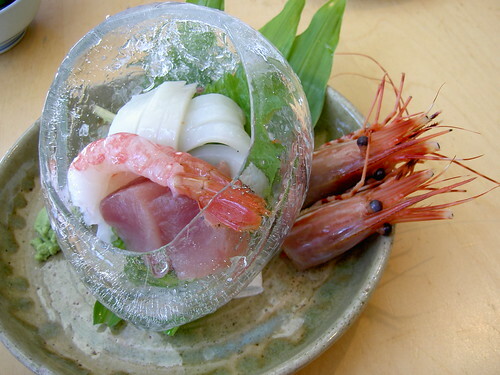 We had Sashimi in a bowl which was made out of ice (limited quantity) and deluxe nigiri $15.95. They grilled the heads of jumbo prawns which were so yummy (Don’t get grossed out non Japanese people!). I was very satisfied. My baby slept all the time during the meal. Phew.